SF-based pianist-composer Eric Tran is known for his friendly stage manner, thoughtful programming, and bold risk-taking. He has appeared in music festivals such as PianoTexas, Aspen, as well as festivals in Europe. His principal studies were with pianists Sharon Mann, Thomas Schultz, and composer Jaroslaw Kapuscinski. Eric is a graduate of Stanford University and the San Francisco Conservatory of Music. During his studies, he was the winner of the concerto competitions of both institutions. In 2013, he was awarded the prestigious Robert M. Golden Medal for outstanding contributions to the arts. 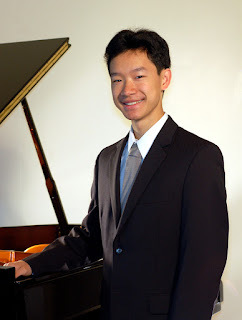 As a composer, he won the Pacific Musical Society Composition Prize 2014, and his sets of children’s music have been programmed for over six years on the syllabus of the US Open Music Competition. His music has been performed by the St. Lawrence String Quartet, the Friction Quartet, his generous friends, and his adorable piano students. Eric also comprises one half of the notorious “Happy Dog” piano duo, with his piano partner, Nathan Cheung. For over a decade, they have performed four-hands originals, transcriptions, and classics alike with a focus on bringing humor and joy to the classical music world. In his spare time, he enjoys a good game of Go.